Matrox Graphics today announced that Utelogy has validated Matrox Maevex H.264 encoders and decoders for use with its AV control and management platform. Matrox Maevex provides a flexible streaming and recording hardware enhancement to the Utelogy software, which on its own provides simple, comprehensive control of an institution’s AV systems. The combined solution is ideal for applications such as distance learning, lecture streaming to overflow sites, classroom and lab recording for later editing or video on demand, campus-wide broadcasts of sports and events and digital signage. Matrox Maevex H.264 encoders and decoders deliver quality AV streaming at low bandwidth over standard IP networks for display or for storage anywhere on the LAN. Maevex encoders can be combined with Maevex decoders or a third-party software decoder to stream up to Full HD digital signage, education and training materials, camera footage, desktop screen capture and other AV content to one or more displays and to collaborative video walls. Maevex encoders can also be used to record live AV content to network-attached storage (NAS) or network-shared drives at resolutions up to 1080p60. 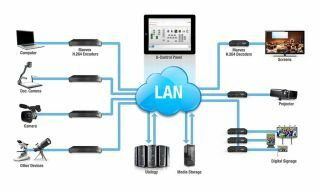 The zero-latency pass through allows real-time monitoring or connection of another device to stream at the same time as recording. Maevex units come bundled with Matrox PowerStream software, allowing for easy remote device management, stream switching and streaming/recording parameter adjustment, including user-definable bitrates between 100Kbps and 25Mbps.